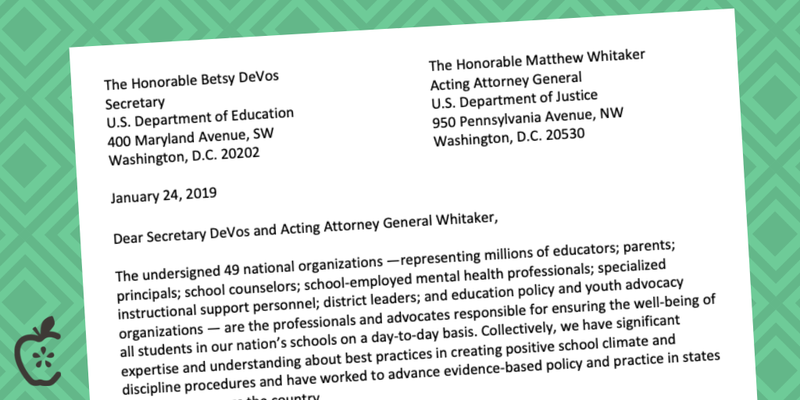 E4E joined a letter with other 48 organizations in condemning the U.S. Department of Education's decision to rescind school discipline guidance implemented in 2014. We should be working to keep kids in class and reduce discrimination, not enable it. The undersigned 49 national organizations —representing millions of educators; parents; principals; school counselors; school-employed mental health professionals; specialized instructional support personnel; district leaders; and education policy and youth advocacy organizations — are the professionals and advocates responsible for ensuring the well-being of all students in our nation’s schools on a day-to-day basis. Collectively, we have significant expertise and understanding about best practices in creating positive school climate and discipline procedures and have worked to advance evidence-based policy and practice in states and districts across the country. While there have been some great strides made in school discipline policy at the local, state, and federal levels, we are disappointed by the recent rescission of the 2014 School Discipline Guidance issued by the U.S. Departments of Education and Justice. Without this guidance, we are concerned that students of color and students with disabilities will face greater levels of exclusionary discipline practices, such as suspension, expulsion and other punishments that remove students from the place created to support them and keep them safe. The decision to rescind the 2014 School Discipline Guidance and associated documents ignores the current research base and the Department of Education’s own data collected by the Department’s Office for Civil Rights. Children and youth deserve to be in school learning alongside their peers. Suspension, expulsion and other punishments that remove students from the learning environment have huge implications for student achievement and success. Research shows that being suspended even once in ninth grade is associated with a twofold increase in the likelihood of dropping out of high school.1 Data also shows that not all students are disciplined at the same rate. Data released in 2014 by the U.S. Department of Education Office for Civil Rights shows large disparities in discipline across our nation’s schools. Students of color face disproportionately high rates of suspension and expulsion and black students are suspended and expelled at a rate three times greater than white students.2 Additionally, students with disabilities are more than twice as likely to receive an out-of-school suspension than students without disabilities. We are gravely concerned by this data because it shows that vulnerable student populations are disproportionately disciplined and suggests a systemic problem in schools. These inequities deserve to be addressed with leadership and guidance from the U.S. Department of Education and Justice. Clear and articulate Federal guidance will support school districts and schools to ensure fair and equitable discipline policies are implemented to create safe, welcoming and non-discriminatory environments for all students. Without this federal leadership and evidence-based guidance, we fear that rates of systemic discriminatory discipline practices in schools will not only continue but increase and disproportionately impact vulnerable student populations. In 2013, leading education practitioner groups released the Framework for Safe and Successful Schools to provide a common set of recommendations for policies and practices that create and sustain safe, supportive learning environments. One goal of the Framework is to advance positive school discipline practices. Endorsed by over 100 organizations, the Framework has successfully influenced important policy including the Every Student Succeeds Act (ESSA). It represents best practices from stakeholders in terms of effective discipline procedures. Experts agree that promoting prosocial behaviors is often the best way to ensure a healthy school environment and remove barriers to learning. Additionally, practices such as restorative justice seek to replace a reactionary and punitive disciplinary approach with individualized and positive behavioral interventions that address a student’s situational and behavioral motivation and seek to prevent future disciplinary incidents. Despite improved discipline policies and practices in many jurisdictions across the country, there is still much work to be done to ensure every student has a safe and supportive learning environment no matter where they live. The rescission of the 2014 School Discipline Guidance is a massive step backward in the collective effort to create healthy school environments. We encourage the Department of Education and related agencies to provide guidance to states, school districts, and individual schools on combating systemic discriminatory discipline practices and policies. In that effort, we encourage those who are serious about improving school discipline practices to consult the Framework for Safe and Successful Schools, as well as the supplemental Policy Recommendations for Implementing the Framework, created to provide schools and districts with evidence-based steps they can take to improve school discipline practices. We remain committed to advancing evidence-based efforts to improve school discipline and reduce instances of systemic and discriminatory discipline towards vulnerable and underserved student populations. We look forward to working with federal, state, and local policymakers to achieve this goal.